We are having a bumper crop from our little garden this year, how 'bout you? Soooooo tasty! I just wanted to share our favorite summer recipe with these yummy treats. This is such an easy, yet delicious dinner - it's perfect for inviting friends and enjoying the lazy days of summer. fresh home-grown or local tomatoes - cherry, grape, diced plum or whatever you've got that's the most fresh! Pour the hot pasta into a bowl and drizzle with olive oil. 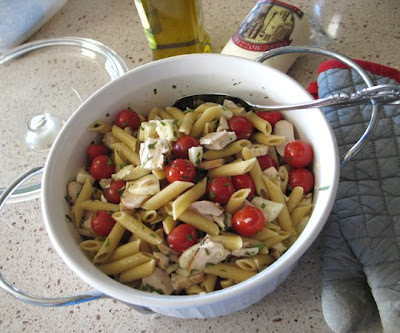 Toss with the chicken, cheese, tomatoes, basil, garlic. Add salt and pepper to taste. Depending on the ripeness and flavor of your tomatoes, you may need to add a little sugar to cut the acidity. Serve with a bagette or simple green side salad. If you're feeding big eaters, use one chicken breast per person, otherwise figure about 1/2 per person. This is the ultimate dish with homemade pasta. Feel free to experiment: skip the side salad and toss in broccoli; this dish is sometimes made with balsamic vinagrette, but we save that "flavor" for when we're making the caprese salad (sliced tomatoes topped with fresh mozz and basil and then drizzled with balsamic). 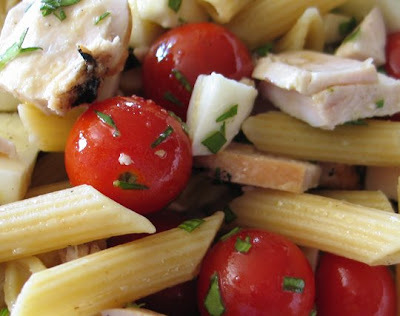 Tip: when you've got the hot charcoal grill going on the weekend, cook a large package of chicken breasts - keep them in the refrigerator for quick weeknight meals: like this pasta, a large dinner salad, burrito/taco/nachos night or wraps to eat on the run! I have no idea how I linked here. I love your blog. This recipe looks great. I am always looking for something new to try. It is colorful and I like that. Jeanne-- I am wanting to go about publishing my ideas into a book. Can I ask for a few tips?